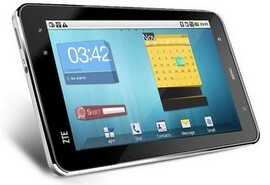 ZTE Group launched its latest touch screen tablet PC, ZTE Light, today in Beijing. The device is displayed at "Beijing Exhibition", bringing various distinct features in a slim and light weight tablet PC. As the ever-growing demand for mobile internet continues, ZTE Light helps to make the internet more portable with its faster browsing experience and 7 inch TFT touch screen. Weighing only 403g ZTE Light is perfect to take with you anywhere and with the utmost of ease.It also supports voice calling on dual band UMTS 2100 MHZ/900 MHZ and internet access on HSUPA network with a download speed of up to 7.2 Mbps and an upload speed of up to5.76Mbps. The device packs smart processing capabilities as it features 512 Mb RAM and 512 Mb ROM and based on Android 2.1 Operating system. Are you businessman? If you are, the try launch your applications through its open Android platform and guarantees access to thousands of third party applications and content services at ease. It fully supports various Google Services, Multi Email account setup, desktop widget applications and online document reading and editing features. Furthermore it can also be turned into a full entertainment device as the large touch screen and G-sensor can support various multimedia and games. In addition its GPS navigation ability can be used as the best guide on the road. Other highlighted features include Wi-Fi, a standard 3Mp camera, Music and video player with Mp4 support, standard picture format compatibility, Bluetooth, external SD Slot with up to 32G external memory, a 3.5mm stereo headset and up to 10 hours of working time.